To get the Windows and Mac versions more aligned, we now have Visual Studio 2019 preview for both platforms. This shiny new version has been introduced as part of Microsoft Connect(); along with a whole lot of other goodness. In this post, I will tell you a few things about what stood out at a first glance. The installation went pretty smooth! Just head over to the download page, download it and install! The great thing is that you can install it side-by-side with your current Visual Studio for Mac installation. But note, you can only run the Visual Studio instance side-by-side. To also run a Xamarin.iOS, Xamarin.Android, Mono, and XCode separately from the rest are a bit trickier. Not impossible, but if you have an extra machine lying around, that might make your life a lot easier. The installation and footprint are much smaller than the previous versions. At least for Xamarin, that is. The workload has been brought down to 7.69GB which is two times less than the current stable version. I must say I’m not an immediate fan of the new Welcome Screen. It feels a bit wasteful that I have this whole Retina screen that can be used and instead I now get a small box with just 5 of the latest projects, which in my case were all pinned ones, and I have to scroll to get to the rest. But maybe that is just me and it needs some getting used to. Daily usage is a bit overstated since the version has just been out for some days at the time of writing, but let me tell you a bit about my experience so far. It is actually quite boring: it works mostly the same. As far as I know, there are no real big features added just yet, so it just works as you did with the current version. That is right; no Live Share, no AI-powered IntelliSense with IntelliCode and no property pane for us Mac users. All this goodness is however available for you on Windows in the Visual Studio 2019 preview, so that might be worth checking out as well. There are some minor issues fixed that will make your daily development life easier though. If we look at the fixed issues you will see a few that have to do with copy-/pasting, indenting and IntelliSense. There is still work to do in that area, but a lot of minor inconveniences have been solved that have annoyed me for just a bit too long. One of the very first things I noticed was that my trusty extensions were disabled. I really came to rely on MFractor and LiveXAML, but both did not work out-of-the-box with the new version. Even more so, they were nowhere even to be found in the “Install Extensions” screen anymore. I contacted Matthew, from MFractor, immediately and he knows what’s up and will work on an update, but can’t promise any timeframe. …Then please let me know 😉 Workaround, for now, is to just go through App Center and get it on my actual device, but of course, that isn’t a sustainable solution. Again: I have no idea if this is related to the new preview, I have a gut feeling it doesn’t, but you can’t say I didn’t warn you! Edit 7 Dec.: my gut feeling was right, had nothing to do with the preview, you can see the problem and solution in this post. You can head over to the Microsoft Docs to check out the full list of release notes. If you are also interested in what has been announced for Xamarin as a whole, check out this page. On Twitter , someone asked me why he should bother with Visual Studio 2019 for Mac, instead of Visual Studio Code, if he is not doing Xamarin. This is actually a good question. 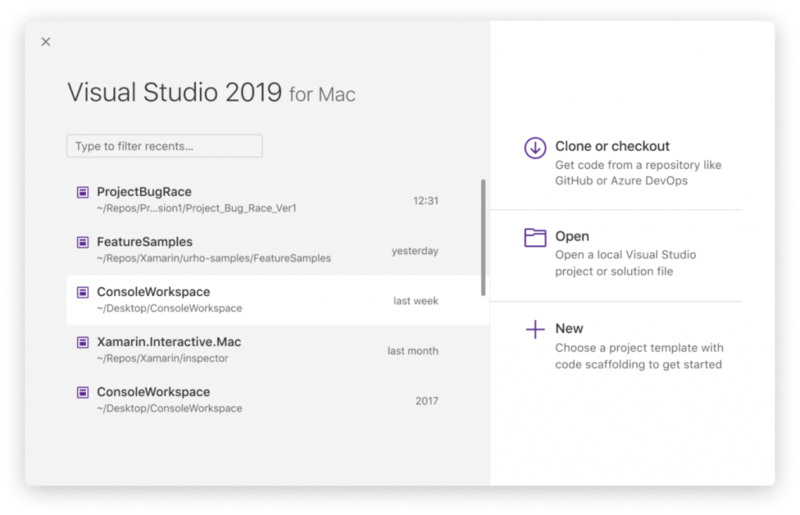 The Visual Studio for Mac experience is closer to what you might be used to on Windows, so that might feel like coming home to you. But, if you like Code and like Live Share (and you should!) and you don’t do anything Xamarin, then VS Code will work for you just as well. Unless you are really curious to have a look at the future, you can safely install Visual Studio for Mac 2019 and switch back to the current stable version if things start to go wrong. If you don’t want to get in the preview right now, you won’t miss very much. No new big features are in there (yet? ), just some stability and alignment it’s big Windows brother. Did I miss anything that is worth mentioning? Please don’t hesitate to let me know!